Government limits on research hinder patient relief. By the time Ann Marie Owen, 61, turned to marijuana to treat her pain, she was struggling to walk and talk. She was also hallucinating. For four years, her doctor prescribed a wide range of opioids for transverse myelitis, a debilitating disease that caused pain, muscle weakness and paralysis. "Even though medical marijuana is legal, none of my doctors were willing to talk to me about it," she says. "They just kept telling me to take opioids." Although 29 states have legalized marijuana to treat pain and other ailments, the growing number of Americans like Owen who use marijuana and the doctors who treat them are caught in the middle of a conflict in federal and state laws — a predicament that is only worsened by thin scientific data. Because the federal government considers marijuana a Schedule 1 drug, research on marijuana or its active ingredients is highly restricted and even discouraged in some cases. Scientists say that stance prevents them from conducting the high-quality research required for FDA approval, even as some early research indicates marijuana might be a promising alternative to opioids or other medicines. "We have the federal government and the state governments driving a hundred miles an hour in the opposite direction when they should be coming together to obtain more scientific data," says Dr. Orrin Devinsky, director at New York University's Comprehensive Epilepsy Center. Devinksy is researching the effects of cannabidiol, an active ingredient of marijuana, on epilepsy. "It's like saying in 1960, 'We're not going to the moon because no one agrees how to get there.' "
Only one federal government contractor grows marijuana for federally funded research. Researchers complain the pot grown by a contractor at the University of Mississippi is inadequate for high-quality studies. "It's public policy before science," says Chinazo Cunningham, a primary care doctor at the Albert Einstein College of Medicine and the lead investigator on one of the few federally funded studies exploring marijuana as a treatment for pain. "The federal government's policies really make it much more difficult." 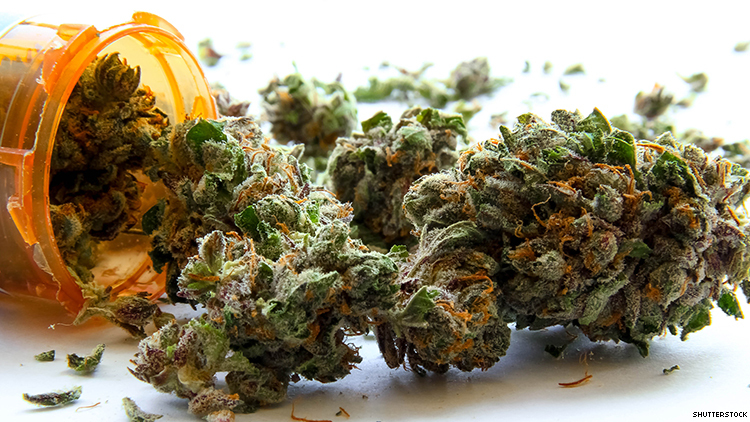 Cunningham received a five-year, $3.8 million federal grant to follow 250 HIV-positive and HIV-negative adults with chronic pain who use opioids and have been certified to get medical marijuana from a dispensary. But she is not allowed to administer marijuana directly to participants. "It's a Catch-22," says Cunningham. "We're going to be looking at all of these issues — age, disease, level of pain — but when we're done, there's the danger that people are going to say 'Oh, it's anecdotal' or that it's inherently flawed because it's not a randomized trial." Some have a "don't ask, don't tell" approach, says Devinsky, who sometimes advises his patients to use it. Others ban its use and substitute opioids or other prescriptions. Young adults, for instance, have had to stop taking cannabidiol compounds for their epilepsy because they're in federally funded group homes, he says. "These kids end up getting seizures again," he says. "This whole situation has created a hodgepodge of insanity." The Trump administration has resisted policy changes. Last year, the Drug Enforcement Administration had been gearing up to allow facilities other than the University of Mississippi to grow pot for research. But after the DEA received 26 applications from other growers, U.S. Attorney General Jeff Sessions halted the initiative. The Department of Veterans Affairs also recently announced it would not fund studies using marijuana compounds to treat ailments such as pain. Patients, meanwhile, forge ahead on their own. "It's saved my life," says the retired university administrative assistant who credits marijuana for weaning her off opioids. "It not only helps my pain, but I can think, walk, and talk again." Mary Jo, a Minnesotan, is afraid of being identified as a medical marijuana user, even though she now helps friends navigate the process and it's legal in her home state. "There's still a stigma," she says. Mary Jo found it eased her pain from a nerve condition. "Nobody helps you figure it out, so you kind of play around with it on your own." Doctors and scientists worry about the implications of such experimentation. Yet those who find that medical marijuana helps them can become fierce advocates, no matter what their doctors say. Caryl Barrett, a 54-year-old who lives in Georgia, says she decided to travel out of state to Colorado to treat her pain from her transverse myelitis and the autoimmune disease neurosarcoidosis. Georgia permits limited medicinal use of marijuana but has not set up dispensaries. "I realized it worked and I decided to bring it back with me," she says. "I broke federal law." The conflict in the law makes her uneasy. But Barrett, who had been on opioids for a decade, says she feels so strongly about it working that "if someone wants to arrest me, bring it on." "She was hopeful that it would help her relax and just kind of enjoy those days," says her daughter, Laura Beckham. The marijuana "didn't seem effective," nor did it keep her mother from hitting her pain pump to get extra doses of an opioid, her daughter says. "We just have no data on how many older adults are using medical marijuana, what they are using it for and most importantly what are the outcomes," says Brian Kaskie, a professor at the University of Iowa's College of Public Health. "It's all anecdotal." In many quarters, there's a growing appetite for solid information, he says. "When I first started this, my colleagues joked we were going to find all the aging hippies who listen to the Grateful Dead," says Kaskie, who has been studying medicinal marijuana for years. "Now, they're starting to realize this is a legitimate area of research." However, it continues to funnel much of its funding into studying the adverse effects of marijuana, researchers say.